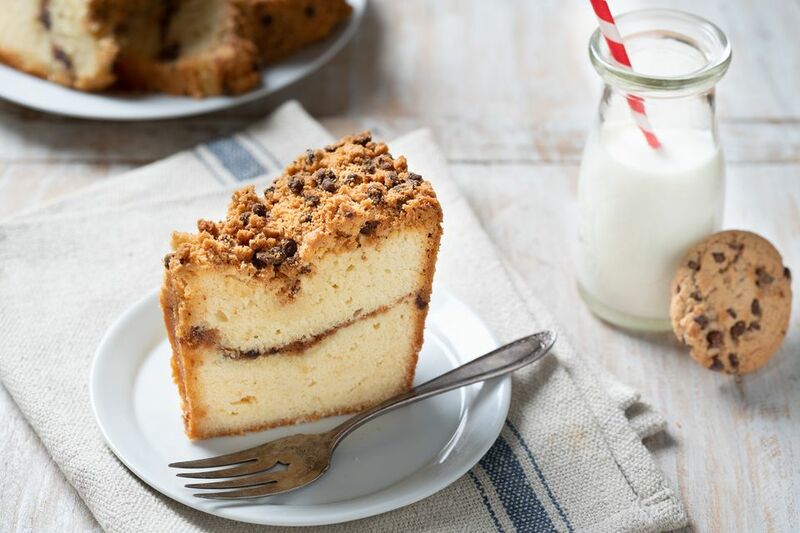 This giant cookie cake combines everything you love about chocolate chip cookies with the moist and tender crumb of a decadent pound cake. The recipe starts with crisp homemade or store-bought chocolate chip cookies and a rich pound-cake-style batter made with cream cheese for added flavor and richness. Half of the batter goes into the bottom of a lined tube pan, followed by a generous sprinkle of the chocolate chip cookie crumbs. Then the rest of the batter is poured on top. Finally, the remaining cookie crumbs on top of the batter and press down lightly to secure them. The result is a distinctive cake with a lovely ribbon of chocolate chip cookies in the center. Place chocolate chip cookies in a large zip top bag and gently crush with a rolling pin until crumbly. Set aside. Preheat oven to 325 F. Grease a 10-inch tube pan with non-stick baking spray. Line the bottom with a ring of parchment paper and spray the paper. In the bowl of an electric mixer, beat the butter and cream cheese until blended. Add the sugar and bread until light and fluffy. Add eggs, one at a time, mixing after each addition. Mix in vanilla extract. Gradually add flour mixture until just incorporated. Pour half the batter into the prepared pan. Sprinkle 1 1/2 cups of the chocolate chip cookie crumbs over the batter. Pour the remaining batter over the crumbs and spread evenly. Sprinkle the remaining crumbs over the top, pressing lightly into the batter. Bake until lightly browned and a wooden skewer inserted in the center comes out clean, about 1 hour and 35 minutes. Let the cake cool in the pan on a wire rack about 1 1/2 hours. Loosen the cake from the sides of the pan with a thin knife. Invert cake onto a wire rack and then invert again so it is right side up. Cool completely. To prepare the pan, trace an outline of the bottom of the pan on a sheet of parchment paper and cut it out to perfectly fit inside the bottom of the tube pan. Then, coat the entire pan with nonstick cooking spray and place the cut parchment paper inside the pan. Finally, coat the top of the paper with additional cooking spray.